Need any help spending these? I was having a conversation with a friend of mine the other day who owns a sweet seaside gift shop that sells a wide range of mid-priced gifts. She mentioned that without the cheaper pound shop lines that she offers, she would be in serious trouble some days. She has to work hard to take in tiddly bits of money, but it’s better than waiting for customers to pay £10.00 for an item on a rainy day when hardly anyone is around. I pointed her at our Pound Shop Lines of course (see them here). The original five and dime store. It feels like pound shops have been with us forever and yet really they have only come to prominence since Woolworths packed up at the beginning of the recession a few years ago. Oh how we miss Woolies! Arguably, Woolworths was the first ‘pound’ shop. 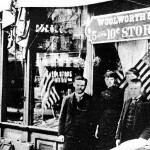 Frank Winfield Woolworth was employed as a retail apprentice when he noticed that many customers naturally gravitated towards the bargain and clearance table, and the items here sold faster than anywhere else. 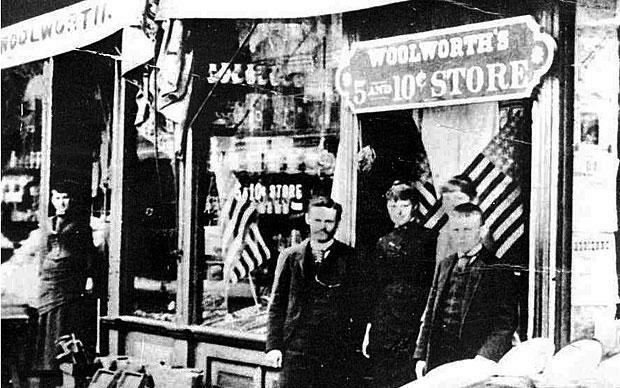 Woolworth was nothing if not a fast learner and a born entrepreneur. He opened his own shop selling goods at rock bottom prices and his empire was born. In those days the stores were known as ‘five and dime’ shops but now our single price stores are extremely popular and are able to command prime locations on some of the best high streets. Enviable indeed. Take Poundland as an example. They have been in operation for 23 years and now have approximately 460 stores. Around 4 million shoppers pop into a Poundland store every week. 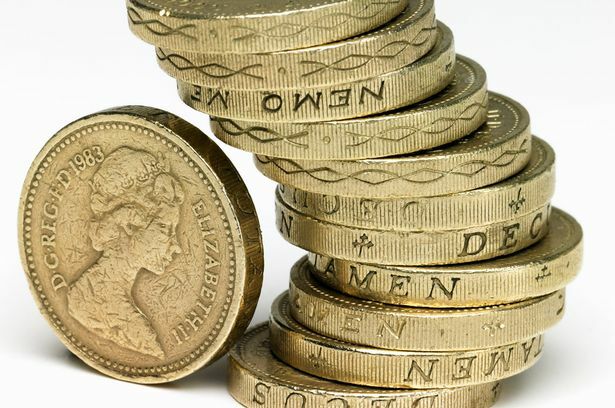 While many businesses on the high street suffer, profits for pound stores are rising all the time. Don’t ask the price, everything’s a pound. Poundland can amaze you with the sheer number of products they can sell. Some sell meat. Mince, flour, butter and milk and all for just a pound. You can get toiletries, medicines, pregnancy tests, sets of toilet rolls, packets of socks, toys, stationery – you name it, it’s available. And the price never changes. 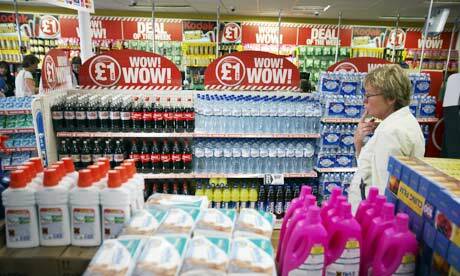 Just how do pound stores manage to beat the prices rises? Well the bigger they get the easier it is of course. •	Large chains such as Poundland can deal directly with manufacturers and this is their major advantage over small businesses. Dealing direct with the manufacturer means that pound chains will pay less by cutting out a middle man and his share of the profits. Some of these chains are able to deal with Nestle, Revlon, Coca Cola, Heinz, Johnson’s, Kraft, United Biscuits and Cadbury. Imagine having that buying power. •	The chains buy up large amounts of surplus or bankrupt stock at rock bottom prices and sell it on. •	They buy warehouse clearance! Woo hoo! •	They can buy end of life products and get them into their outlets quickly for resale. •	Much of what they buy comes from abroad where it is cheaper to manufacture. An awful lot comes from China and pound shops can brand their own products. 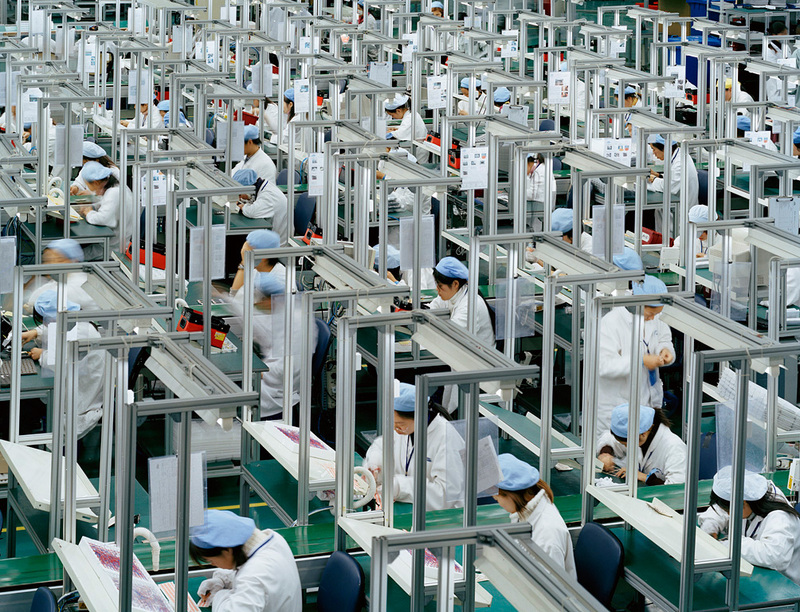 The power of China to manufacture. 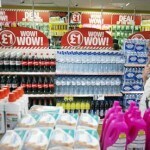 Why don’t pound shops ever have to increase their prices? The biggest downside of being a budget retailer such as a pound shop is that you have to try and absorb rising costs. For example, when VAT went up to 20% in January 2011 that put pressure on the chains, as does price rises caused by inflation and high energy and import costs. At this stage the pound shop chains have several options. 1. 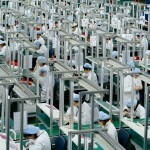 They can renegotiate directly with their suppliers so that the supplier takes the hit. 3. They can reduce the size of their products. This latter move is clever. In 2007 you could purchase 10 bags of Quavers for £1, but nowadays you’re more likely to get 5 -7 bags. Similarly where a standard loaf size is 800g, the cheaper chains will sell a 600g loaf for £1. You see similar things happening with chocolate, biscuits and washing powder. How do pound chains make their profit? The pound chains make their money by buying huge quantities extremely cheaply. They then sell them at low prices. Each sale results in profit of just a few pennies – maybe 30 pence per pound. So gross margin is set at around 30%. Just 30 pence per sale means that they have to sell volume in order to make money. The other thing that pound shops do extremely well is market themselves. Everyone knows the cost of everything in the shop before they even enter the premises. There are no surprises. What is surprising is the huge range of goodies on offer and that bargains can be found even among the discount lines. Big suppliers will sell packets of chocolate bars that are 4 bars plus 2 free – so big flashes and posters in lurid colours will show that the buyer is getting 50% extra! In fact most supermarkets will have these deals too but they have to invest time and money battling on other price points on thousands of other products. So, check out our discount lines and pound shop items and see what you can use to start making your fortune today.